Utah could be the worst major conference team in basketball this season. But the Utes are bad. They have yet to beat a Division-1 opponent, per Ken Pomeroy’s stat monster they’re not expected to win a game other than Friday’s Idaho state game, and they’ve twice failed to score more than their football team’s scoring high (54). 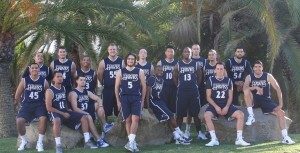 The tribulations of Larry Krystkowiak’s crew are the best thing to happen to San Diego Christian College. The small Christian school in the eastern hills of San Diego is 365-387 all-time, their winningest coach is Art Wilmore, and – I repeat – they’re in San Diego. If you’re not getting my San Diego references then you’ve never been there before. Do yourself a favor: go. Here’s the link to book it. Should the Utes prove to be as abysmal as statistically expected, SDCC will get some run off pub as the only team Utah beat in their miserable season. The question: do you want this to happen? Like I wanted the the 2007 Patriots to go 19-0, the Miami Heat to go 73-9 (CBA fail), Michael Phelps to do what he did, and the 2008 Lions to go defeated, this is another “I remember when” moment. One of those things you’ll get to talk about in bars for years to come. OK, so an 0-fer season in a medial Pac-12 maybe isn’t bar talk of epic proportions, but you can’t tell me you never get into unwarranted one-up battles that could use some ammo like these Utes. Which would then have you appreciating Tom Hansen’s television legacy in which nothing is aired and all basketball and football, good or bad, is lost on the non-broadcast albeit wealthy airwaves of Fox Sports Pacific Northeast Central Coastal Net. Fact of the matter is, with Utah being this bad, no one will have to watch so it begs another question: if a Utah has a win-less season and no games are broadcast, does it really happen? If you’re a San Diego Christian College Hawk it sure as hell does.